Specialist Four George Alan Ingalls (9 March 1946 - 16 April 1967) was a U.S. Army soldier and a recipient of the U.S. military's highest award for valor, the Medal of Honor, for his heroic actions in the Vietnam War. Ingalls was born on 9 March 1946, in Hanford, CA. He joined the Army at Los Angeles, CA. 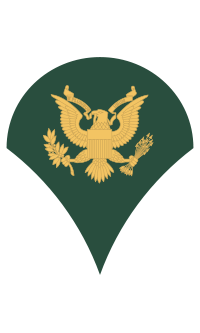 On 16 April 1967, he was serving as a Specialist Four in Company A, 2d Battalion, 5th Cavalry Regiment, 1st Cavalry Division (Airmobile). 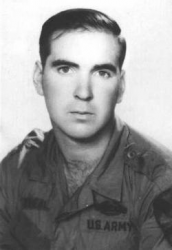 On that day, near Duc Pho in the Republic of Vietnam, Ingalls covered an enemy-thrown hand grenade with his body, sacrificing his life to protect those around him. Citation: For conspicuous gallantry and intrepidity in action at the risk of his life above and beyond the call of duty. Sp4 Ingalls, a member of Company A, accompanied his squad on a night ambush mission. Shortly after the ambush was established, an enemy soldier entered the killing zone and was shot when he tried to evade capture. Other enemy soldiers were expected to enter the area, and the ambush was maintained in the same location. Two quiet hours passed without incident, then suddenly a hand grenade was thrown from the nearby dense undergrowth into the center of the squad's position. The grenade did not explode, but shortly thereafter a second grenade landed directly between Sp4 Ingalls and a nearby comrade. Although he could have jumped to a safe position, Sp4 Ingalls, in a spontaneous act of great courage, threw himself on the grenade and absorbed its full blast. The explosion mortally wounded Sp4 Ingalls, but his heroic action saved the lives of the remaining members of his squad. His gallantry and selfless devotion to his comrades are in keeping with the highest traditions of the military service and reflects great credit upon Sp4 Ingalls, his unit, and the U.S. Army. George Alan Ingalls' name is inscribed on Panel 18E - Line 35. Specialist Four George Alan Ingalls was killed in action on 16 April 1967. Ingalls is buried at Pierce Brothers Crestlawn Memorial Park & Mortuary in Riverside, CA, in Vesperland Section, Grave A-620.